The environments you use in your adventures help define your world. 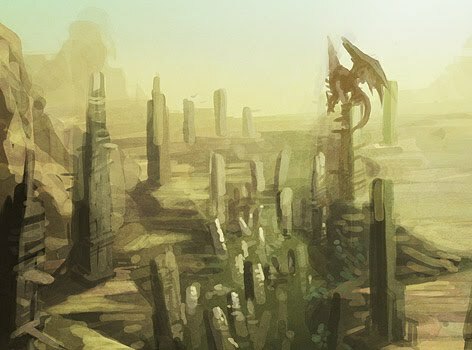 This chapter has the rules for dungeon, wilderness, and city environments. Trap-filled dungeons, haunted forests, deadly deserts, eerie swamps, forbidding mountains, and exotic cities are all staples of fantasy adventure. The environment of a campaign is almost as important as the characters and the plot—describing the environment is essential to a great game, and bringing these locations to life creates a vibrant and immersive experience for your players. These labyrinths, full of deadly traps, hungry monsters, and priceless treasure, test every skill a character possesses. Dungeons can be almost anything, from a vast cave complex to a ruined castle or the wreck of a sunken ship. The four basic dungeon types are defined by their current status. Many dungeons are variations on these basic types or combinations of more than one of them. Sometimes old dungeons are used over time by different inhabitants for different purposes. This place is now abandoned by its original creator or creators, and other creatures have wandered in. Many monsters look for abandoned dungeons to live in. Any traps there have probably been triggered, but monsters wandering the halls may be common. This type of dungeon is still in use. Creatures (usually intelligent) live there, although they might not be the dungeon’s creators. An occupied structure might be a home, a fortress, a temple, an active mine, a prison, or a headquarters. This type of dungeon is less likely to have traps or wandering beasts, and more likely to have organized guards. Traps or wandering monsters that might be encountered are usually under the control of the occupants. Occupied structures have furnishings to suit the inhabitants, as well as decorations, supplies, and the ability for occupants to move around. The inhabitants might have a communication system, and they almost certainly control an exit to the outside. Some dungeons are partially occupied and partially empty or in ruins. In such cases, the occupants are typically not the original builders, but instead a group of intelligent creatures that have set up their base or lair within an abandoned dungeon. When people want to protect something, they sometimes bury it underground. Whether the item they want to protect is a fabulous treasure, a forbidden artifact, or the dead body of an important person, these valuable objects are placed within a dungeon and surrounded by barriers, traps, and guardians. The safe storage dungeon is the most likely to have traps but the least likely to have wandering monsters. This type of dungeon is normally built for function rather than appearance, but sometimes it has ornamentation in the form of statuary or painted walls. This is particularly true of the tombs of important people. Sometimes, however, a vault or a crypt is constructed in such a way as to house living guardians. The problem with this strategy is that something must be done to keep the creatures alive while they guard the place. Magic is usually the best solution to provide food and water for these creatures. Builders of vaults or tombs often use undead monsters because they have no need for sustenance or rest. Magic traps can attack intruders by summoning monsters into the dungeon that disappear when their task is done. Cave complexes provide homes for all sorts of subterranean monsters. Created naturally and connected by winding tunnels, these caverns lack any sort of pattern, order, or decoration. As it wasn’t built by an intelligent creature, this type of dungeon is the least likely to have traps (or even doors). Natural cavern complexes often connect with other types of dungeons. For example, a dwarven mine may break into a series of natural caves. The cavern may even connect different dungeons at either end, like an underground road. This type of environment includes temperate forests, frozen timberland, steaming jungles, haunted groves, and mystical woods with lurking fairies—any area with significant plant growth and low visibility. Swamp environments include dry areas with frequent flooding, coastal deltas with slow-moving rivers, and tangled overgrown areas with standing water. Swamp terrain is much like forest terrain, but less hospitable. This type of environment includes snow-capped peaks, dangerous ravines, volcanoes, and other high, rocky elevations. Mountains tend to have caves and waterfalls, with many places for monsters to hide. Desert environments see little rainfall, whether hot deserts in the rain shadow of mountains, cold tundra where the ground is permanently frozen, or cursed lands where old magic has ruined the earth and storms are rare. City environments include bustling metropolises, thriving frontier towns, remote villages, and rustic farmsteads. Depending on the country, a city may have knights and wizards or pyramids and mummies.